These FLOURLESS CHOCOLATE CHIP COOKIES are so good! Made with no butter, no refined white sugar, and no flour. So delicious & good you wouldn’t even think they were healthier, even though they are! Sounds like an oxymoron, but trust me, they are the best cookies ever. There are a couple of tricks for making these incredible thick, chewy, and soft-baked flourless chocolate chip cookies. After the holidays come and go, I still have a sweet tooth. You would think I had enough cookies and sweet treats, but nope. However, my body is telling me I need to lay off of the desserts. I am still in love with these white chocolate macadamia nut cookies. I think a healthier and flourless version is needed. What do you say? 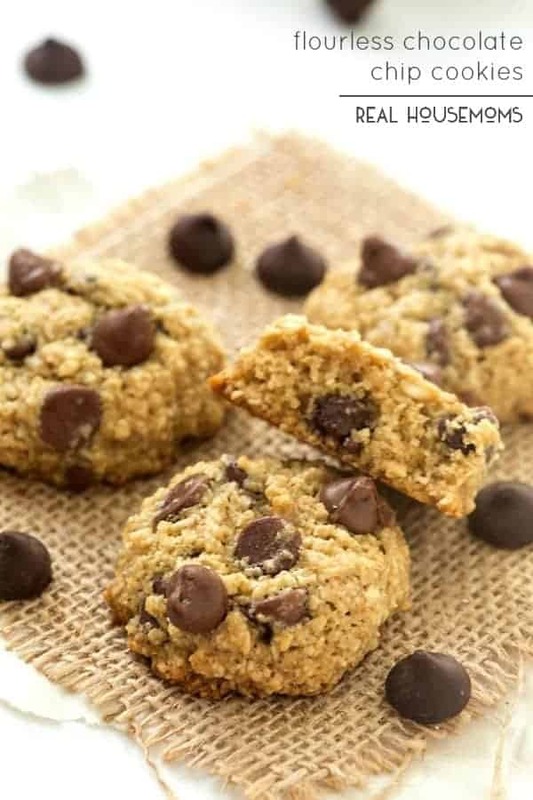 So let’s bake cookies that are a little healthier for you to satisfy your sweet tooth. You won’t even miss the traditional butter loaded; flour packed, and sugar loaded cookies. Trust me. A couple of tricks to make these cookies turn out amazing. Please measure all of the ingredients correctly. Too much oat flour will make the cookies dry and crumbly. The coconut oil is a must. It’s what binds the cookies together, so please do not substitute any other oil for the coconut oil. Oat flour is old-fashioned oats pulsed in a food processor until it resembles flour. When measuring out the cookie dough, use a cookie scoop and make sure you tightly packed the cookie scoop. After I measure it out, I pressed it again my palm, making sure it’s packed tightly, then release the cookie dough onto the baking sheet. Other than that, they are easy and tasty! These FLOURLESS CHOCOLATE CHIP COOKIES are so good! Made with no butter, no refined white sugar, and no flour. So delicious & good you wouldn't even think they were healthier, even though they are! Mix the egg, vanilla extract, light brown sugar, salt, and coconut oil in a medium mixing bowl until creamed. 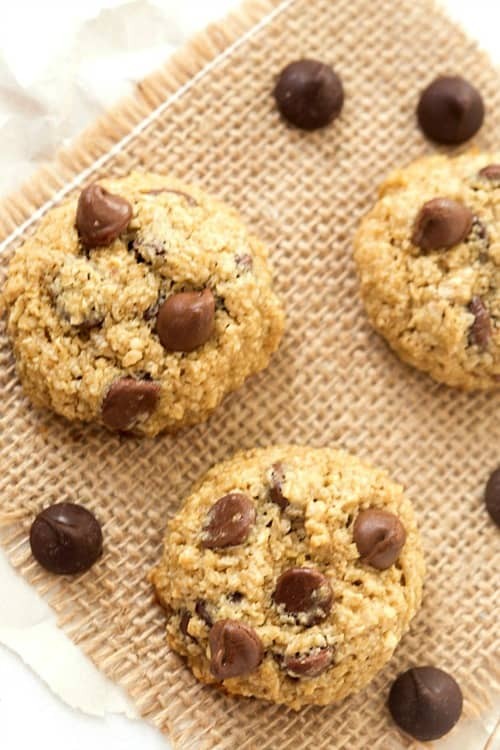 Add the oat flour, baking soda, and chocolate chips until combined. Cover with plastic wrap and place into the refrigerator for one hour. Preheat oven to 350 degrees. Line a baking sheet with parchment paper or a non-stick baking mat. Scoop cookie dough onto the baking sheet, make sure you are using a medium cookie scoop and pressing the cookie dough tightly into the cookie scoop. Bake for 10 minutes. Allow the cookies to cool for 2 minutes, then transfer to a cooling rack. Store extra cookies in an airtight container for up to three days. *Make sure the coconut oil is melted and NOT hot. Measure the coconut oil after it has melted. **Oat flour is pulsed old-fashioned oats in a food processor. Measure the oat flour after it's been pulsed. What can you substitute for the coconut oil if you have an allergy? I don’t own a cookie scoop! Is there something else I could use?! Those cookies look delicious. 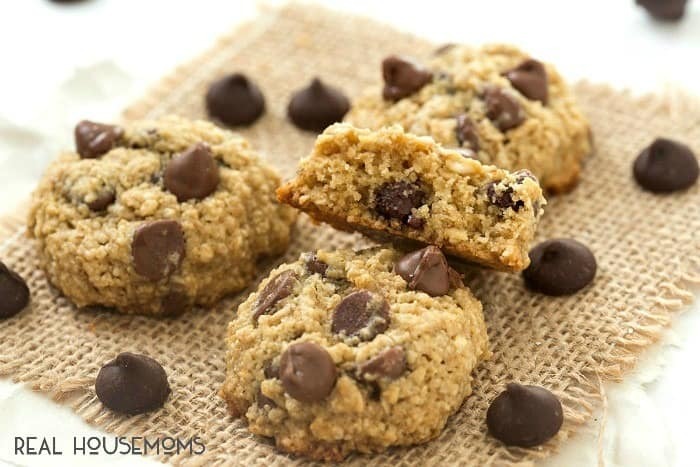 Giving them a shot, as oatmeal/chocolate chip is a favorite. But, just a heads up: brown sugar is made by refining sugar, then adding molasses back to the white sugar when they are done. Maybe substitute turbinado or evaporated cane juice instead? These were good, but there was a strange bitter taste that came through in bites that didn’t have chips. I think it’s the baking soda. Could I use less? I might try 1/2 tsp and see if they still turn out. Thanks for this great idea!! I tried this recipe and my friends loved it. I love your site!! Thank you so much!! I’m so glad to hear that you liked this recipe, my hope is that you’ll take a look around to find more that you love just as well.